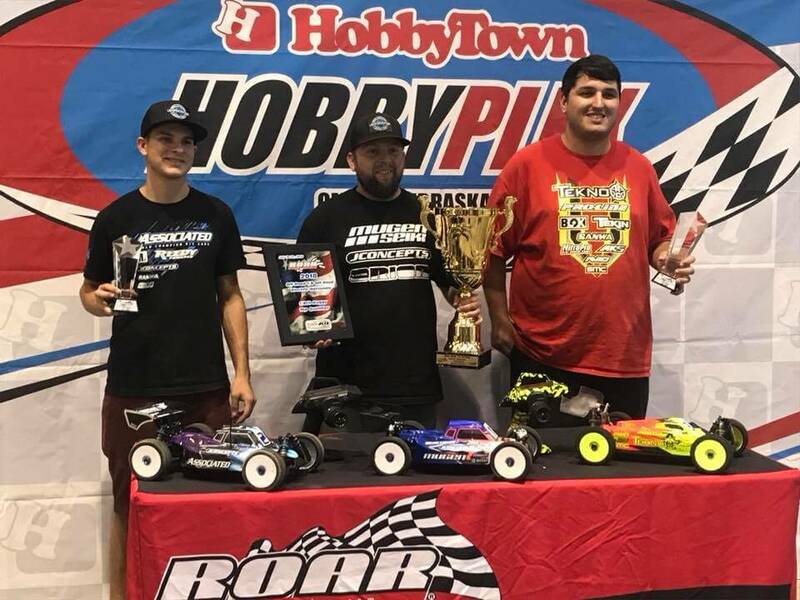 "This week, the traveling circus that is professional RC car racing traveled to Omaha Nebraska for this year’s installment of the ROAR 1/8 Electric Nationals. 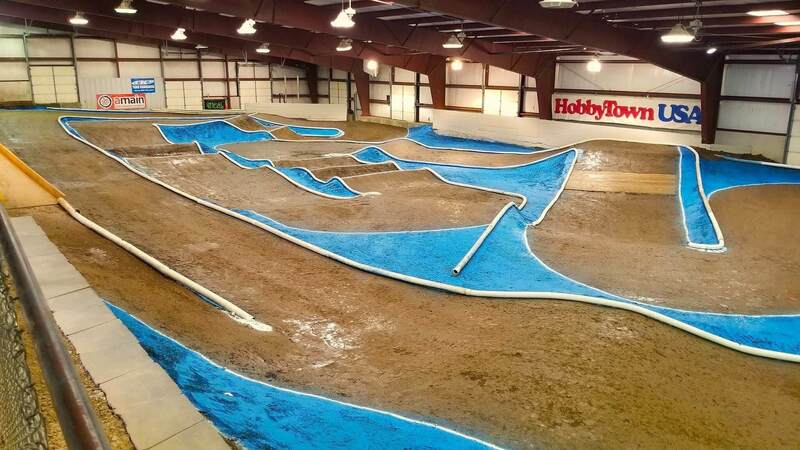 Practice started on Thursday morning, and with a little bit of a light turnout I was able to get a lot of track time with all of my cars. Also with this being an indoor race, the tire and sauce game was super important. It was a lot like 1/10 racing where we needed to get tires broken in and then set aside for qualifying. On Friday, the schedule was to have two seeding rounds and then two qualifiers. Seeding went well for me in all classes where I fought with Maifield for top seed in Truggy, got top seed in SCT and was 4th in Buggy. I felt confident going into the qualifying rounds and they went pretty well also. I got out to a good start in Truggy but had an unfortunate mistake and dropped back to 4th for the round. In SCT and Buggy I was able to stay clean and grab the TQ in both for the first round. 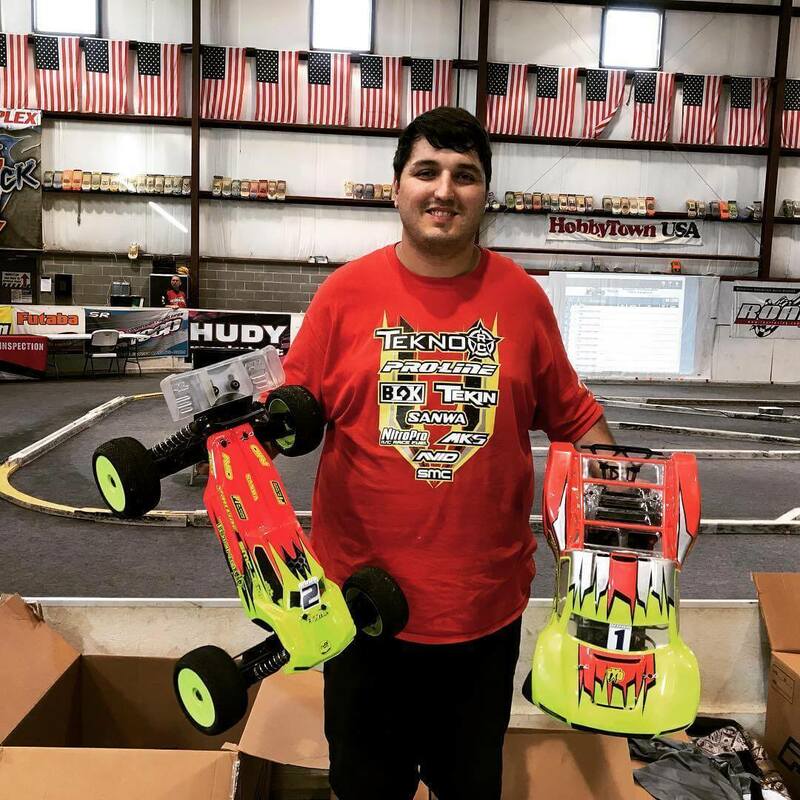 For round two, I stayed clean in both Truggy and SCT grabbing the TQ for the round in those two and my mistake happened in Buggy where I ended up 6th for the round. This would leave me sitting as overnight TQ for Truggy and SCT and 2nd in Buggy behind Maifield. For Saturday we had 4 more rounds of qualifying on tap. It was quite a bit of an up and down day for me. I had a few TQ runs throughout the day and also ran out of talent quite a few times too. In Buggy I stayed right around 4th all day, but grabbed a 3rd in the last round to put me 3rd on the grid for the Triple A mains. In Truggy, Maifield grabbed the first two rounds of the day, and I took the last two rounds of the day. This left us tied with 3 TQ’s each, and fortunately I won the tie breaker with a couple of faster runs. In SCT, I struggled to put a run together most of the day which left Lutz to grab a couple TQ’s and Tanner Denney to also get one. Going into the last round, basically whoever won would take overall TQ. Fortunately I had my head on straight and put a solid run together to take the round and overall TQ for the class! 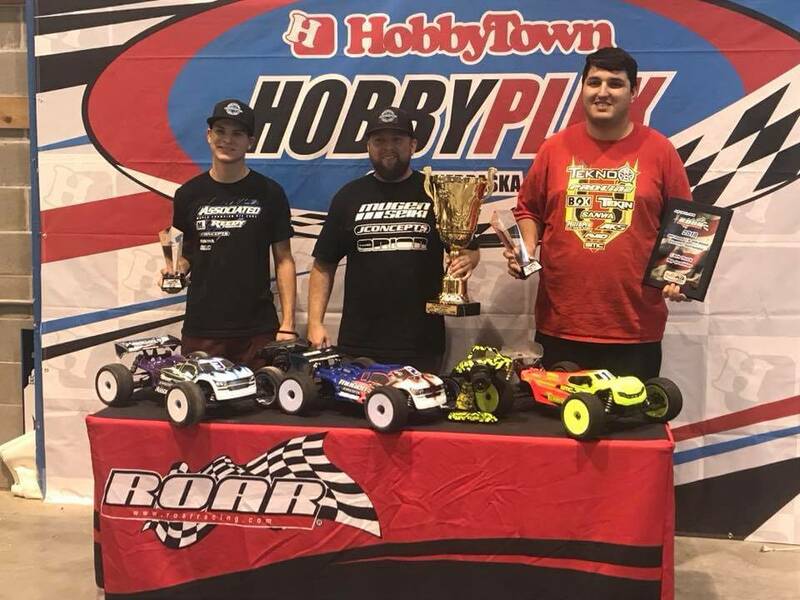 The Tekno team did well also with Ryan being in all of the mains, Tyler Hooks making both 1/8 mains and a lot of other team drivers in the B mains against the stacked field. The rest of the night was spent prepping our cars, tires and whatever else we could think of for the mains. With 3 classes and not very many heats, there wasn’t much time to work on our cars throughout the day so they had to be prepped well. 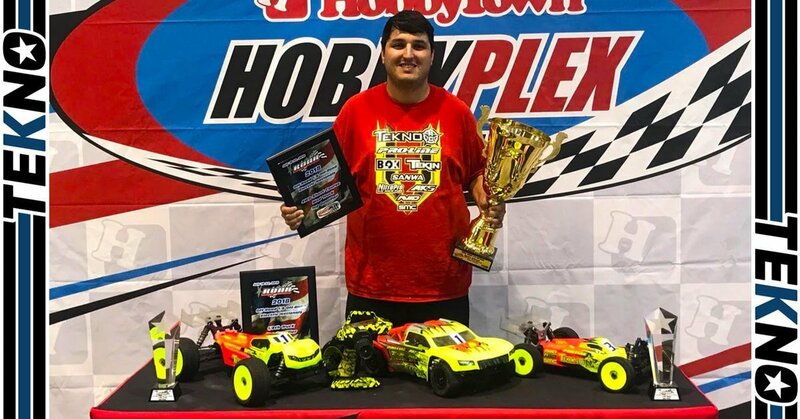 Joe managed to get the TQ in both Truggy and SCT classes! Sunday was main day. I started the day watching and helping some teammates in the lower mains but also keeping an eye on the track conditions. We never changed the type of tire we were running, but having multiple tires with different pin heights for different track conditions was important. Before we knew it, we were on the stand for the first round of mains. In Truggy A1, I tried to put in a couple heaters early to make an attempt at running away. I put a quick gap on Maifield but ran out of talent again and clipped a tube putting me back to 3rd. From there on I drove as fast as I could and by the end I got to the bumper of Maifield, but just couldn’t find a place to try a pass. We ended 2 tenths apart and I had to settle for second. SCT A1 I was able to get out early and control the race. Mid way I made a mistake, but held on to the lead. Lutz was right on my bumper and stayed there for the final 3 minutes but I was able to hold onto it and bring home the A1 win. In A1 of Buggy, I started 3rd and finished 3rd. 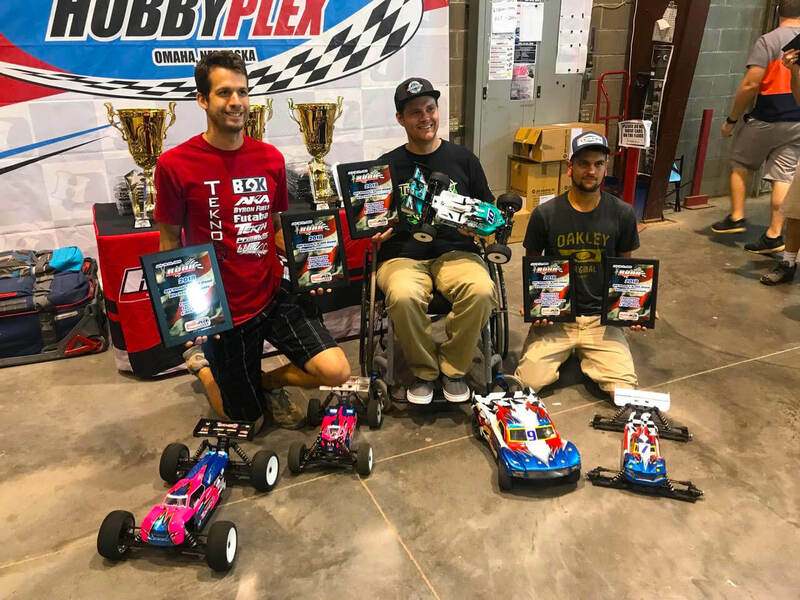 Not a whole lot happened, the top 3 of us stayed clean and freight trained the whole time and finished where we qualified. 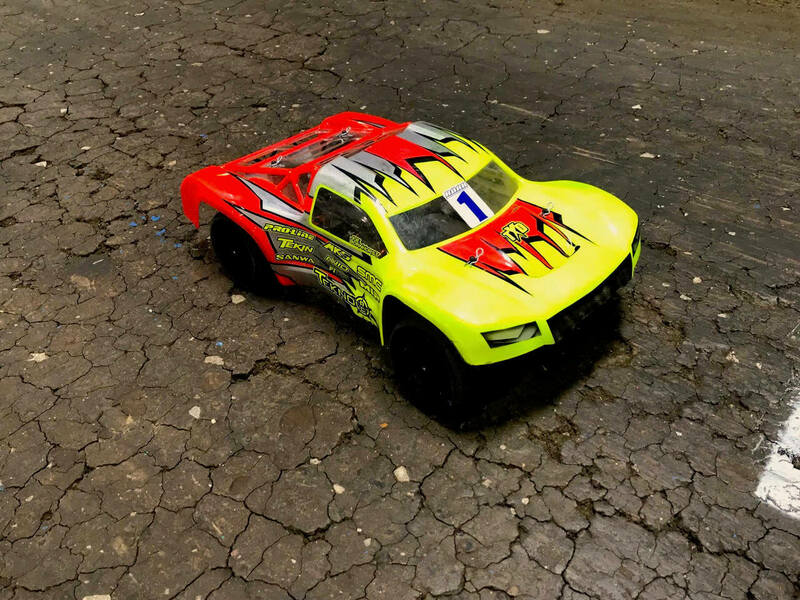 Tekno RC cars are not only fast but looking good too! Concours winners! Second round of mains. Truggy was up first again. I tried to do the same as A1 and wanted to sneak away quick. This time though, Maifield was on my bumper the whole time. I kept the lead for the first 4 minutes or so, but went onto 2 wheels in the sweeper and he was able to sneak to the inside of me. He didnt make another mistake and I had to settle for another 2nd. In SCT A2, I got out to a clean start and tried to sneak away. This time Lutz wanted to grab the lead early and went for a move but tagged me and spun me around. He waited and that handed Denney the lead, me 2nd and Lutz 3rd. Denney made a mistake a few laps later giving me back the lead. Then I made another mistake a few laps later but was able to hold onto the lead with Lutz right behind me. Then Lutz made a couple mistakes allowing me to sneak away and bring home the A2 win and my first National Championship! In Buggy A2, I got out to a clean start again, Maifield made an early mistake which put me in 2nd right behind Rivkin. I tried to just sit behind him and wait for an opening but unfortunately had a weird crash which put me back to 6th. I stayed there the rest of the race, and then in the final corner of the race I saw an explosion of E-buggies out of the corner of my eye with cars going everywhere. It was an exciting finish, but I was just a little too far behind to capatalize on anything. Third and final round of mains. In Truggy, I figured that I pretty much had 2nd locked up based on time, but still wanted to grab a win. With Maifield sitting it out, I got out to an early lead and never looked back. Put in a clean solid run and pulled away a bit for the A3 win. In Buggy A3, I started behind Rivkin and stayed there waiting for a mistake. That came around I think 2 minutes in, handing me the lead. Mason Fuller was then right on my bumper and stayed there until the end. I was able to stay clean and grab another A3 win for 2nd overall for the class! Overall it was an awesome weekend. I had a lot of good runs and was able to have my best ROAR National finishes yet! 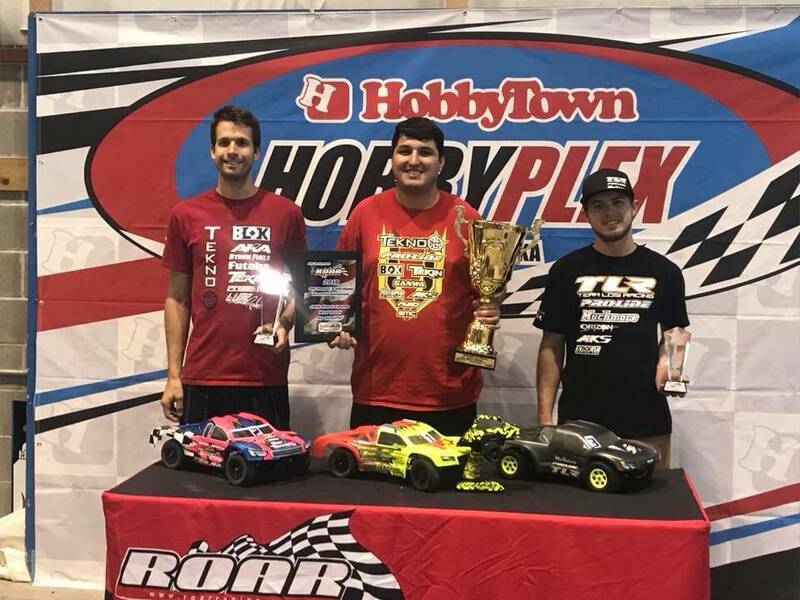 It was pretty special being handed the National Championship trophy for SCT, which was not only my first but Tekno RC’s first National Title as well. Now its time to switch over to the small cars for a bit again for the 1/10 Nationals in Pheonix in a few weeks. See everyone there! " 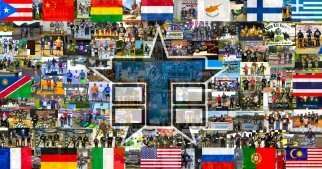 Tekno RC Win Report 2017! Tekno EB48 Wins Belgian MBRC 10 Hour Endurance Race with TecRace Team.